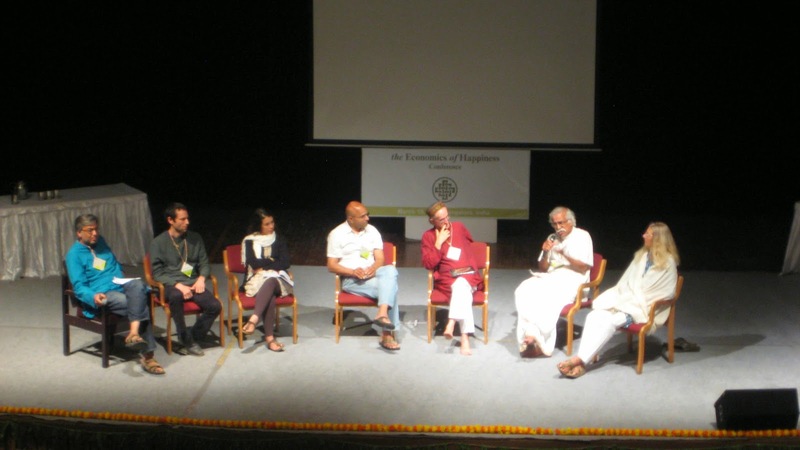 I recently had the privilege of participating in the 'Economics of Happiness' Conference at Bangalore (March 14-16). Here is a collection of some brilliant quotes by Charles Eisenstein, Kamila, Aseem Srivastava, Felix, Claude ALvares, Helene Norberg during a panel discussion. Each of them could actually be made into a compelling poster! * The only thing that economists economise on is happiness. * ‘Scarcity is a fact of life’ is the biggest illusion. * To produce scarcity out of abundance requires the genius of economists. * The machinery of illusions needs to be dismantled. * Development is the process of converting life into money. Progress is the process of adding technological razzamatazz to it. * The market economy destroys what is real in order to replace it with something that is artificial. For instance, it had to break down society and create isolated individuals and then sell back “social networking” like facebook. And it makes money both ways! * In order to destroy that which is sacred, the market economy labels it superstition. * Our financial system sets up a ‘musical chair’ game and tempts us to fight for the limited chairs, always throwing someone out! * The market economy forces us to purchase the feeling of belonging. * Even capitalists don’t believe in capitalism anymore. The core is hollowing out. * Those who call me ‘naïve and romantic’ do so from a space of deep grief and sorrow within. Every child is born into this world with the knowledge that the world can be more beautiful, and that she has a special and unique gift to offer to the world. When this knowledge is suppressed and betrayed over and over again, she retreats into cynicism as a way of escaping from being betrayed again! * The market economy is based on wants, which actually come from unmet needs. A child who does not get real love and nurturance is offered coco-cola and told “To be happy, drink coco-cola. And drink it infinitely”. * We have banned the local from ourselves. When parents discourage their children from speaking their native language, they are sowing the first seeds of cultural genocide. * If you know who you really are, a unique person with a unique set of gifts to offer to the world, you won’t find the need to hide behind expensive branded jeans and shoes. * The fact that the US military with all its weapons has been kicked out of every country it invaded, is proof for the fact that there is something much stronger than military power. This is a living sign of life, and our hope! * Separating grandparents from grandchildren is the most efficient way to create unhappiness. Reconstituting inter-generational spaces is one of the most important tasks ahead of us. Sangeeta: Thanks so much for this. From the conference, I could retain only few in my mind. I am also looking for the video, do you have it? Please let me know. Deepak, No, I don't have the video with me. These are what I noted down in my notebook during the session. Aravinda, it's about 'borrowing' an onion to 'give it back someday'. At least, that's what I think it means! Regarding the onion statement: Earlier, the onion was a common ingredient in an Indian home, especially a poor man or a farmer's. Roti/Bhakri with onion is the staple diet. And in India almost every household uses it daily- rich to poor. India has the world’s largest area under onion cultivation and, in terms of production volume, is only second to China. Yet with the rising economics of something like an onion, people had stopped buying something that was always there in their kitchens. And this caused crisis in politics and governments. But more importantly it signified the breakdown of society, and hence the culture. So when a person asks their neighbour for an onion, one can only imagine how bad the situation may be.